Space Shuttle Discovery for its Return to Flight mission - Solar System Planets And Moons Section. Space Shuttle Discovery for its Return to Flight mission. If you've got clear skies tonight, you should have an easy time finding Comet Machholz with your unaided eye - and it'll look even better in binoculars or a small telescope. That's because the Comet will pass only 2-degrees away from a familiar object in the sky tonight; the Seven Sisters, a.k.a. the Pleiades star cluster. Head outside and face south; you can find Pleiades just above the constellation of Orion. Machholz will be 52 million km away from our planet this week; unfortunately, that's the closest it's going to get. Topography Mission Wraps Up With Australia. After four years of data crunching, NASA and the National Geospatial-Intelligence Agency have completed a comprehensive topographical map of 80% of the Earth's surface. Australia, New Zealand and the South Pacific were the final areas released to the public this week. Many of the smaller islands have never been properly mapped because of their remoteness, often being obscured by persistent clouds. It's these smaller islands which are at great risk to weather and long-term sea level rise, so being able to predict where water levels will go will be very helpful to mitigating future disasters like the Asian Tsunami. 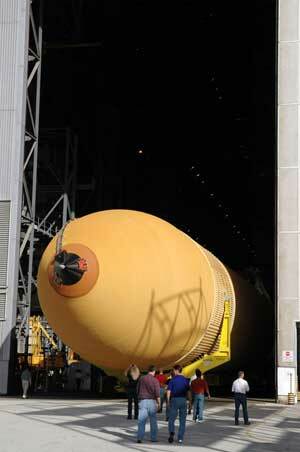 New Space Shuttle Tank Arrives in Florida. NASA completed a major milestone this week as part of its work to get the Space Shuttle fleet flying again when the newly redesigned external fuel tank arrived at the Kennedy Space Center in Florida. The tank will eventually be mated with the Space Shuttle Discovery for its Return to Flight mission, STS-114. NASA and Lockheed Martin have spent almost two years redesigning the tank to make it safer. One major redesign was on the forward bipod fitting, which shed the foam that led to the destruction of Columbia last year.